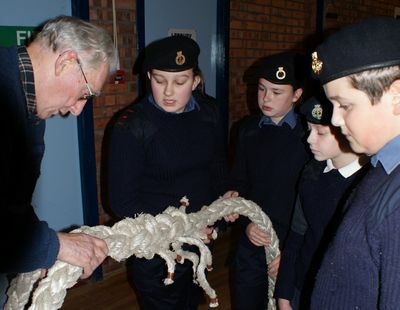 Methil & District Sea Cadets stepped up to the challenge when staff from the Methil Heritage Centre asked if they would splice a ‘wee piece of rope’. This ‘wee piece of rope’ turned out to be an 8 strand, 4 braided rope and a challenge! With splicing tools in hand and under the guidance of Mr Ian Hill, the splicing began. ‘It took the best part of the day to complete the splice, the rope was not the easiest to work with due to wear and tear; but the end result looks not too bad,’ said Mr Hill. The finished piece of work was completed on Wednesday and the cadets made short work of finishing of the ends of rope. ‘When the splicing was nearly finished Mr Hill explained that the rope was reduced gradually to give a neat tapered finish. It looks great. We got to handle and use some of the tools for splicing and they are really sharp, ‘ said Leading Junior Cadet Mia Dair. 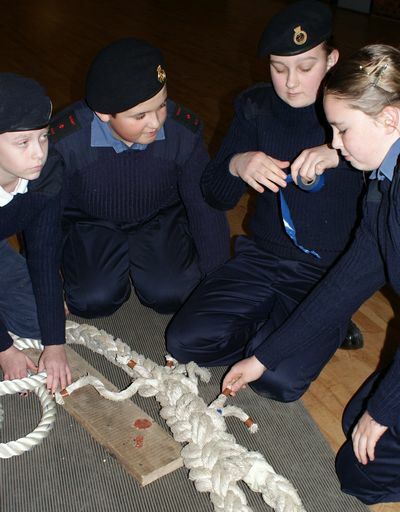 The sea cadets learn a wide variety of seamanship skills and splicing is just one of them. If you are interested come along to our Unit on a Monday and Wednesday evening between 7 – 9pm. 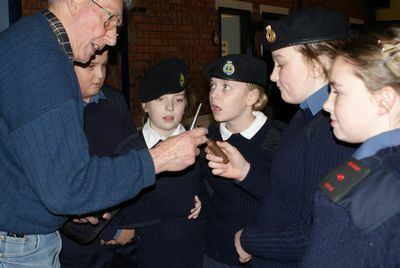 Our junior cadets start from 10years old and senior cadets from 12years to 18years. Leading Junior Cadet Mia Dair; Cadet Jack Thomson; Cadet Cassey Ward and Cadet Natalie Dobbie. Photographs: by SLt Fiona Sekkat.